Labradoodles Diet: Which Is The Best Food to Feed, Raw or Dry Kibble? 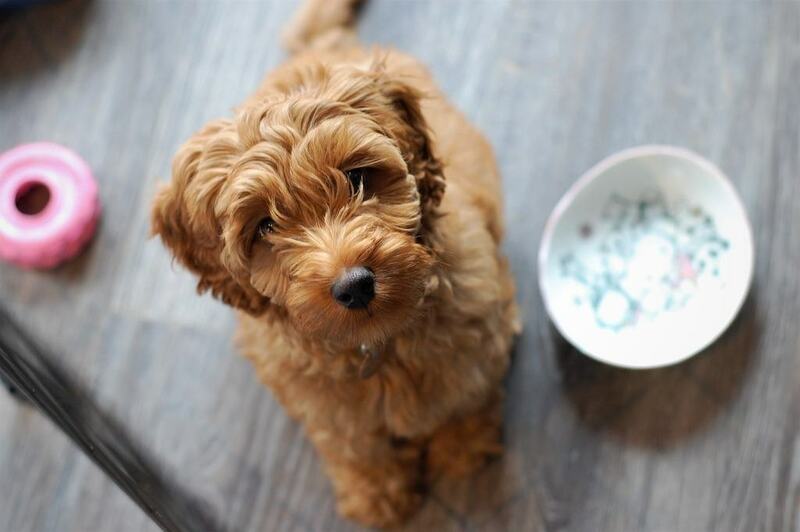 » Labradoodles Diet: Which Is The Best Food to Feed, Raw or Dry Kibble? Labradoodles are a cross between a poodle and a Labrador retriever. They’re hypoallergenic and were originally bred as guide dogs, but since then they’ve become a popular family dog too. Labradoodles are easy to love because they’re very social with people, kids, and other dogs. As a bonus, they don’t shed a lot either. The adorable, fun, and easy to train Labradoodle makes a terrific addition to an active family or someone in need of a therapy dog. As a beloved member of the family, it’s important to get your Labradoodle’s nutrition just right. Proper nutrition will help ensure that your dog is healthy, happy, and energetic in the long-term. This is the best dry grain-free dog food to feed a Labradoodle, because it is high in quality protein, low in fats and carbohydrates and it’s 100% Made in the USA. As a dog owner, you may wonder which is better - raw feeding or a commercial diet like dry kibble- for your Labradoodle? Both feeding methods have their own pros and cons, which is why owners should do some research before choosing what method to go with. Some commercial dog food brands have come under fire for selling low-priced food with sub-par ingredients. However, if you avoid grocery store and bargain brands, there are a lot of great commercial kibbles out there. Premium dog food brands should have real meat as a first ingredient and not contain a lot of fillers like corn meal, soy, or meat by-products. Another good indicator that a dog food is made specifically to meet your pet’s nutritional needs is an AAFCO statement on the packaging. AAFCO branding is used to tell owners that a food meets the nutritional requirements of their dog at different life stages. Even though AAFCO has no regulatory authority, the state and manufacturers must make sure that this statement is accurate. Many people believe that it’s beneficial to feed their dogs a diet that consists of raw meats and vegetables because it’s healthy and natural. Going with a raw diet is possible but should be done carefully and with the advice of a vet or other expert. The BARF diet (Biologically Approved Raw Diet conceived by Dr. Ian Billinghurst) is one option can be purchased, delivered or made at home. Some perks of a raw diet are that you know exactly what you’re feeding your dog - real meat, vegetables, and healthy carbohydrates - no cheap fillers or controversial ingredients. The problem is that raw diets that aren’t prepared properly can be risky. These diets can also be expensive and little inconvenient if you aren’t prepared to spend a lot of time preparing your dog’s food. The following are the backbone to making a nutritious and balanced meal for your Labradoodle. Choose any good quality meat - chicken, lamb, duck, rabbit, beef turkey and fish. Make sure you add at least one organ: liver, kidney, spleen, pancreas, tripe or heart. Add a portion of veggies, choose either carrots, peas or green beans. Choose low GI carbs cooked sweet potato, brown rice or oats. Extra bits to add like garlic, eggs, herbs, fish oil. Store-bought raw foods can save time and help make sure that your dog’s diet is nutritionally balanced. Puppies need food with higher protein and fat, around 22% and 8% respectively. Deciding on your Labradoodle’s calorie requirements depends on whether they are standard, medium, or miniature breed. Measure your Labradoodle’s food based on the label instructions on their commercial dog food or carefully prepare raw meals in portions appropriate for your dog’s size. Dry kibble should be fed starting at four meals a day for puppies to two meals a day for adults. It’s important not to leave food out for your Labradoodle all the time. This breed is not one that will stop eating when full, so owners need to stick to feeding times and measure their dog’s food. High-quality commercial dry food or a raw diet carefully prepared using expert advice can both be used to meet your Labradoodle’s nutritional needs. Issues with raw feeding stem from owners not feeding their pups adequately and not having properly done their research. What is the best brand of dog food for Labradoodles? There are several dog food brands that make great choices for a Labradoodle, including Rachel Ray Nutrish, Zignature, Nature’s Variety Instinct (Raw & Freeze Dried Kibble), Canidae (All Life Stages) , TOTW (Grain-Free) and Diamond Naturals. Can you mix raw & dry dog food? Yes, you can mix raw and dry dog food to give your dog’s diet a little added nutrition and flavor (especially if your dog is highly active and needs to eat more). Things like meat, fish, fish oil, vegetables, and healthy low GI carbs can be added to your dog’s diet in small amounts. Owners thinking of changing their dog’s diet should consult their vet to make sure that they do so safely. Be aware that suddenly introducing raw meat into their dog’s diet or mixing kibble and raw meat can cause gastro intestinal problems. If you feed your dog commercial food, the best thing to do is feed them based on the instructions on the label. Go by your dog’s specific weight rather than just the breed or general size, since this is the best way to maintain your dog’s nutrition and avoid problems like obesity. If you go with a raw diet, it is best to follow recipes and instructions provided by a vet, dog expert, or breeder. Also if your Larbadoodle is more active, than you may need to feed him/her 2.5% or more to maintain a healthy weight. So determining their activity levels, breed consideration, and ideal body weight is key when working out the raw food quantity to feed your dog/puppy. First Five Ingredients: Turkey, Turkey Meal, Chicken Meal, Dried Peas, Pea flour. Among the top commercial dry dog food brands, the one that stands out as best for Labradoodles is Rachel Ray Nutrish PEAK Northern Woodlands Recipe with Turkey, Duck & Quail. PEAK is a natural, grain-free dry dog food made in the USA using only the best ingredients. This nutrient-dense food has no gluten, fillers, poultry by-product meal, and artificial flavors, colors, or preservatives. What makes this dry dog food stand out is its high percentage of protein (30%) from unique protein sources that are perfect for dogs with allergies. U.S. farm-raised turkey is the first ingredient, along with turkey meal, chicken meal, duck, and quail. The other top ingredients are dried peas, pea flour, and whole dried potatoes. Peas and pea flour are healthy sources of carbs, protein, and nutrients for dogs. This Rachel Ray brand dog food is made in partnership with Ainsworth Pet Nutrition, a company with 80+ years’ experience in the industry. 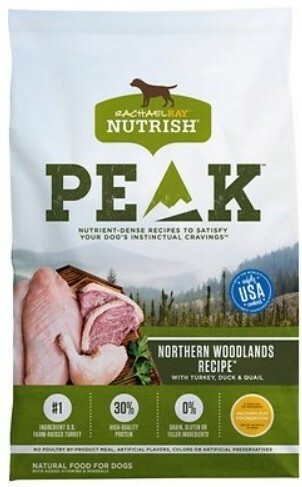 PEAK is formulated to meet the AAFCO nutritional levels for all life stages. There have been no recalls of this above-average dry dog food, which is affordable compared to competing brands and has great customer reviews. Also, part of the sales go to helping dogs in need. Labradoodles are great dogs that need a quality canine diet to maintain their high energy levels. This friendly breed is prone to allergies, so a limited ingredient or hypoallergenic dog food might be your best bet. Trusted commercial brands of dry dog food like Rachel Ray Nutrish can give your Labradoodle the balanced nutrition it needs. Another alternative is responsible raw feeding with the help of an expert.